As an attorney, you know that writing skills for your Internet marketing strategy are essential for your success. You rely on your ability to articulate your thoughts and persuade their audience to win cases. Law firm marketing relies on the same skills that make you an excellent attorney because your online audience needs the same kind of persuasion to win their trust online. While excellent lawyers craft a solid briefs to win more cases, those same attorneys struggle to write compelling content. 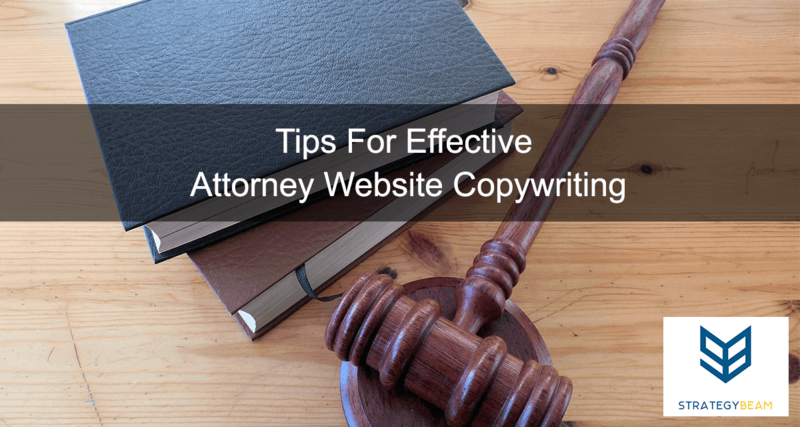 A professional website content copywriter can help attorneys craft a great message and drive more clients to their law firm. Poor copywriting will have an enormous impact on the overall marketing efforts of your law firm, and cause a major hit to your bottom line. If you are spending money on PPC, or other forms of paid advertising, then your copywriting has to be rock-solid and resonate with your reader and get them to convert. Freelance copywriting is a great investment for law firms who are looking to drive qualified traffic to their firm so they can focus on cases and grow their business instead of wasting time and money on marketing efforts that fail. You can also check out the huge list of free small business marketing tools that you can use to grow your law firm today! Here are a few tips to help you improve your law firm website copywriting to establish rapport, build confidence, prompt action, and convert your readers. The end goal is to increase conversions and grow your law firm. The first tip to improve your law firm marketing is always to speak to your reader. This will look different depending on what type of law you practice, who your audience is, and what their needs are. The most important thing to remember when creating content for your law firm is that you are dealing with real people, and they are looking for your law firm as a solution to their problems. Be sensitive to the emotional state of your audience when writing copy for your website to draw them in and build rapport. Always personalize your content and show your reader that they are going to work with real people. An excellent example of this can be seen on the Trust Tree “About Us” page. I love the great website copy used on this page to invite their readers into the lives of the attorneys. Plus, this page doesn’t hype the intellect of the attorneys and staff like many law firm websites do. The attorneys at Trust Tree use humor to show that they are not only professionals in their field of law but also know how to treat their potential clients as people. The next step to create compelling law firm marketing copy is always to talk about the needs of your audience. This means reducing the amount of unnecessary jargon and using terminology that is approachable and concise. People know that you are smart because you are an attorney. Instead of pumping out a bunch of copy that states your intellect, you should be writing copy to compel your audience with the value you offer to their specific needs. The primary focus of your website should be to attract, persuade, and convert potentials into paying clients. Stay away from making statements and use your firm website as a tool to show value and address concerns of your audience. You should center your SEO marketing strategy around the needs of your clients, so your law firm will rank in Google based on the questions and issues that your clients face. I have seen many law firms forget to connect the needs of their audience with the solutions they offer. This not only helps your reader identify their needs and connect with solutions from your law firm but also helps them understand what they need. Marketing for lawyers is unique because attorneys deal with a particular set of services for a very particular set of clientele. As is the case with any highly competitive niche, marketing for law firms relies on maintaining a strict focus on each page and piece of content. If you want your law firm to excel, make sure that you build each page of your website with a particular purpose in mind for your readers. Optimize each page with graphics, relevant content, and strong Call To Actions. Only having bios on the “About Us” page. Writing for the needs of a specific audience on that audience page. For example, only writing for small business owners on a page for small businesses. Expand on the services of your law firm only on the “Services” page. Digital marketing depends on strong copywriting for any industry, and this remains a vital component of law firm marketing. Without great copy, your law firm can’t connect with your readers, convert prospects to paying clients or stand out from your competition. If your law firm is looking for a professional freelance copywriter to help you attract and convert the clients you need, then feel free to reach out and let’s talk about how we can grow your law firm together! Now it’s your turn! Let me know in the comments below about how your law firm marketing creates great copywriting to attract new clients!